Is Artificial Grass For You? Home / News / Is Artificial Grass For You? Artificial grass has been growing in popularity in recent years. What once looked incredibly fake, now offers a cost-effective, low maintenance alternative that looks the real thing. 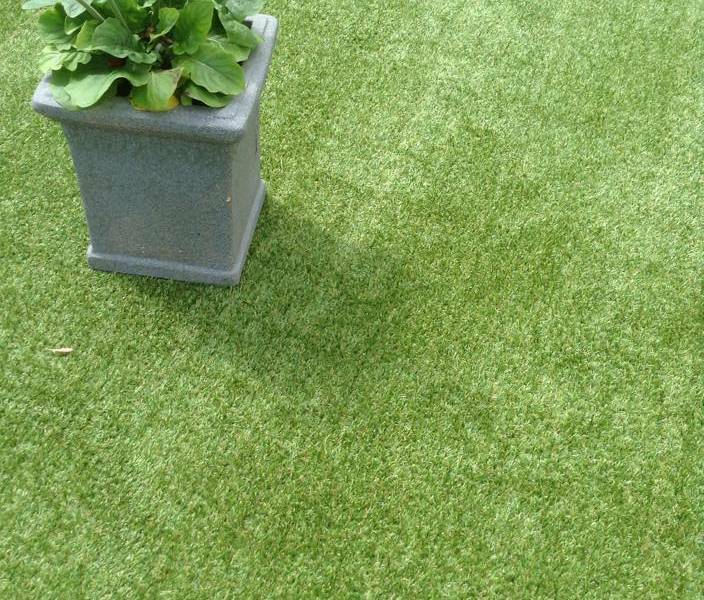 With more people opting for synthetic grass in their gardens, would you be happy to invest in some fantastic plastic that looks as good as the real thing? Let’s look at the arguments for and against keeping your traditional turf lawn versus upgrading to a modern day garden carpet. Great for the enivornment– A well covered area of natural grass is also an amazing mini-habitat to all kinds of bugs and beasties. Bees love it too – and we need to be nice to the bees. A lawn that is left to its own devices for a wet weekend or two too long, is actually an amazingly eco-friendly habitat and our insect populations will thank us for it. Takes time to maintain– As lovely as our lawns may look and smell, time is short. We are busy and our lawns are just one more thing to deal with on our ever increasing to-do lists. We have to be in the office, on the school run, stuck in front of our smart phones and devices. Time is a valuable commodity and there certainly isn’t any spare to waste on frivolities like gardening. Natural lawns they take a lot of time, love and dedication to keep them looking good. From mowing and strimming, watering and feeding, right down to seeding patches or tending to sparse areas. Can look poor if not maintained correctly– If not properly looked after, your lawn can become a muddy bog in the winter and a brown patch of scrub in the summer. When you have a growing family your grass can suffer at the hands of the constant games of football, the drenching from the paddling pool and the constant weight of trampolines and other garden structures. Real grass can look stunning, but it can also be a right royal pain to look after. Maybe a lawn is best enjoyed when someone else is looking after it. Spend enough time in country parks, open spaces and safely homes and you’ll get your greenery fix without any stress. Having come a long way from the Astroturf of old, modern synthetic grass is becoming a popular choice for urban gardens everywhere. Ease of use– It’s incredibly easy to install. Simply add a layer of sand, level out the surface, lay down the membrane, roll out the grass and hey voila, it’s ready to be enjoyed. No feeding, no bedding in and no ongoing maintenance – simple! Value for money– Whilst it is true that artificial grass is more expensive to buy than traditional turf, it can last up to 15 years without fuss, making your initial outlay far more cost-effective. Easy on the eyes and the feet– Not as brittle and fake feeling as you would imagine, modern synthetics are soft underfoot, available in different lengths and will remain looking green and pleasant for as long as it is well fitted. Easy to maintain – No mowing, no raking, no strimming, no feeding and no looking after in general. Your neighbours will stop and stare at your magnificent lawn, whilst you sit back and enjoy the adulation. Initial Expense– First off, it is definitely more expensive to lay than turf. You may even want to shell out a little extra to have it fitted professionally. Whilst we truly believe that artificial lawns do pay for themselves over time, it is just worth keeping the extra upfront expense in mind. Not as good for the environment– As it’s made from plastic, there are some environmental drawbacks due to the manufacturing process. Pet Owners Beware– Finally, if you are a pet owner, you may have mixed feelings about synthetic grass and it won’t absorb animal waste like real grass does. An artificial lawn is the perfect modern day solution to the age old problem of how to keep you grass green all year round. Of course, you might miss the smell of freshly cut grass after the rain, but you can probably buy a scented candle to help you deal with that!